Of the four types of dietary fat, monounsaturated fat is the only one that isn’t riddled with controversy. Just one search for “healthy fat” will yield thousands of articles recommending the consumption of foods that are high in monounsaturated fats. Regardless of the diet or the person, it seems that this fatty acid is unanimously crowned as being healthy. The same cannot be said for other naturally occurring fats like saturated fats and polyunsaturated fats, which both have research backing their potential to benefit, as well as worsen, our health. Are there any downsides to consuming monounsaturated fats? How much monounsaturated fat should you eat? Monounsaturated fatty acids, also referred to as MUFAs, are a type of dietary fat found in plant and animal foods. It is considered to be a healthy fat because of its positive effects on overall health, particularly on blood pressure and cholesterol levels. The discovery that monounsaturated fat could be healthful came from the Seven Countries Study during the 1960s. It revealed that people in Greece and other parts of the Mediterranean region experienced a low rate of heart disease despite having a high-fat diet. However, their primary source of fat was not saturated animal fats, commonly found in countries with higher rates of heart disease. Instead, they relied on olive oil, which derives roughly 75% of its calories from monounsaturated fat. Monounsaturated fats are liquid at room temperature, but start to harden when chilled. This is why olive oil begins to solidify when put in the fridge. Although monounsaturated fats are found in most of the foods we consume, the highest percentage of MUFAs are typically found plant foods. More specifically, animal fats tend to derive between 40 to 50% of their total fat from the monounsaturated type, while many plant fats contain over 65% (e.g., avocados, olive oil, macadamias, and high-oleic sunflower oil). For good health, it is typically recommended to get the majority of our fats from monounsaturated and polyunsaturated fatty acids. One of the main reasons why many health professionals came to this consensus can be found when we look at these fats through a microscope. There are four main types of fat in your diet — monounsaturated, polyunsaturated, saturated, and trans fatty acids. Each one is essentially a chain of carbon atoms linked together. The crucial characteristic that sets them apart is how these carbon atoms are bonded together. Unsaturated fats, for example, are fatty acids that have at least one double bond between their carbon atoms. Monounsaturated fatty acids, or MUFAs, are a type of unsaturated fat that only has one double bond. The “mono-” (meaning “one”) lets us know that there is only one carbon-to-carbon double bond in that fatty acid. In contrast, all polyunsaturated fats have more than one carbon-to-carbon double bond, and all saturated fats are “saturated” with single bonds and contain no double bonds. The number and location of these double bonds play a crucial role in determining the properties of the fat. Just one or two double bonds, for example, is all it takes to shift the melting point so that it is liquid, instead of solid, at room temperature. This is why almost all natural plant oils stay liquid in the cupboard. Many of them contain such high amounts of monounsaturated and polyunsaturated fats that their melting point is much lower than animal fats and coconut oil, which are much higher in saturated fat. The number and location of the double bonds on a fatty acid chain also are responsible for the potential effects that a specific fat has on our health. As an example, oleic acid — the most common type of MUFA found in our diets — has slightly different effects on cholesterol levels when compared to another less common MUFA called palmitoleic. Although they both have one double bond in their fatty acid chain, that double bond is found between different carbon atoms in that chain. What seems like an inconsequential difference to us makes a significant difference in how it affects our health. That being said, rarely will we find foods that only have one particular type of fatty acid in nature. Thus, to assess the health effects of fat in a practical way, we must look at the research on the foods and diets that are high in monounsaturated fatty acids — the preponderance of which shows overwhelmingly positive results. We’ll take a closer look at the research behind these findings below. The current evidence suggests that high fat, low carb diets yield similar amounts of weight loss — and in some cases, more weight loss — than low-fat diets. Research also indicates that the types of fats we consume on higher fat diets may play a role in how much weight we lose as well. A 2016 meta-analysis, for example, discovered that replacing carbs with monounsaturated fat may stimulate more weight loss than expected. In their meta-analysis, the authors included 24 studies with 1,460 participants comparing high-MUFA to high-carb diets. The mean dietary composition for the high-MUFA diet was 17.0% protein, 39.4% carbs, 43.1% fat, and 24.5% MUFA, while the high-carb intervention was 17.3% protein, 54.1% carbs, 27.6% fat, and 11.0% MUFA. They aimed to keep protein and saturated fat intake equal between groups to help filter out the effects of these variables. On average, the high-MUFA groups lost 3.43 more pounds than the high-carb groups. There were also significant reductions in fasting blood sugar, triglycerides, and systolic blood pressure along with substantial increases in HDL cholesterol. If we dig deeper into the research, we also find that high-MUFA meals tend to stimulate the use of fat for fuel more than meals that are high in long-chain saturated fats. It is possible that this increase in fat burning caused by monounsaturated fat consumption may be one of the mechanisms that help with weight loss. Simply put, high-MUFA diets can be an effective way to lose weight when monounsaturated fats are used to replace other calories from carbs. The same is true for heart health as well. There is substantial evidence supporting that increased MUFA consumption can help reduce many risk factors for heart disease, particularly if you’re replacing saturated fat and/or carbohydrates. Many studies have shown that a high intake of monounsaturated fats can reduce blood cholesterol, triglycerides, and blood pressure — three crucial cardiovascular disease risk factors. One study, in particular, compared three months of a high-MUFA diet with a high-saturated-fat diet to examine their effects on blood cholesterol. This study found that the diet high in saturated fat increased unhealthy LDL cholesterol by 4%, while the high-MUFA diet reduced LDL cholesterol by 5%. Several other studies have found similar results of MUFAs reducing LDL cholesterol with the added benefit of increasing “good” HDL cholesterol. High-MUFA diets have been found to help lower blood pressure when compared to higher carb diets as well. A large study of 164 people with high blood pressure found that a high-MUFA diet lowered blood pressure and the risk of heart disease more so than a high-carb diet. However, there is no evidence to suggest that chugging down a bottle of olive oil will give you these benefits. To optimize the benefits of adopting a high-MUFA diet, you must consume these fats in place of saturated fat and/or carbs that are currently part of your diet. Furthermore, in each of these studies, the high-MUFA diets were part of calorie-controlled diets, meaning that adding extra calories to your diet with high-MUFA foods and oils may not provide the same benefits. There is also some evidence that diets rich in monounsaturated fats may help reduce the risk of certain cancers. More specifically, the impact of high-MUFA diets on colon, breast, and prostate cancer has been studied most extensively. Some research suggests that a high-MUFA diet has a protective effect against prostate cancer, while other studies found a slight negative effect or no effect at all. One group of researchers speculate that MUFA-rich plant foods may be responsible for the positive findings rather than the MUFAs themselves. However, the effect of monounsaturated fats on prostate cancer risk remains unclear. Several observational studies also uncovered an association between olive oil consumption and lower rates of breast cancer as well as a reduced risk of colon cancer. Since olive oil mostly consists of monounsaturated fats, they might have a protective effect against these cancers. Keep in mind, however, that all of these studies were observational, meaning they don’t examine cause and effect relationships. Other variables, such as the beneficial compounds found in olive oil and the lifestyle differences of those who eat more healthy fats, are likely playing a role in the research findings as well. Keeping blood sugar levels under control is essential for optimal health. To do this, we must stimulate insulin sensitivity with our lifestyle and our diet. One dietary component that may help us in our effort to sustain optimal blood sugar levels is monounsaturated fats. Studies have shown that high-MUFA diets can improve insulin sensitivity in those with and without high blood sugar levels. One study of 162 healthy individuals found that eating a high-MUFA diet for three months improved insulin sensitivity by 9%. Other studies have found similar beneficial effects of high-MUFA diets on insulin and blood sugar control. However, this doesn’t mean that we should be supplementing with a shot of olive oil to lower blood sugar levels. A recent meta-analysis of various studies indicates that these positive effects occur when we replace some of the calories we consume from carbs with monounsaturated fats. This simple dietary strategy, when combined with a calorie deficit for weight loss, has been found to significantly improve insulin resistance, insulin sensitivity, and blood sugar levels. Inflammation is a normal immune system process that helps your body fight infection and heal from injury. However, this process can also occur chronically and contribute to chronic diseases like obesity and heart disease. When compared to other diets, including high-saturated-fat diets and Western diets, high-MUFA diets have been found to reduce inflammation. One study, for example, found that high-MUFA diets decreased inflammation in patients with metabolic syndrome when compared those following high-saturated-fat diets. Other studies have shown that people who eat a Mediterranean diet that is high in monounsaturated fats have significantly lower inflammatory molecules in their blood, such as C-reactive protein (CRP) and interleukin-6 (IL-6). Once again, it is important to mention that MUFA consumption is not the only reason for these profound results. High-MUFA diets, such as the Mediterranean diet, tend to limit the intake of processed foods and oils that can provoke inflammation and promote the consumption of whole plant foods with phytonutrients that can help relieve inflammation. In other words, an effective strategy to reduce inflammation is replacing highly processed foods with whole plant foods and healthy oils that are high in MUFAs. This, in turn, can help reduce your risk of inflammation-related conditions such as heart disease, obesity, and metabolic syndrome. The Mediterranean diet, which features MUFA-rich foods and oils, has been found to reduce mortality risk from heart disease and its complications. This makes sense after learning about the positive effects that high-MUFA diets can have on cholesterol, triglyceride, and blood pressure levels. Epidemiological studies support the life-promoting benefits of MUFAs as well. One large study, for example, discovered that replacing 5% of energy from saturated fats with the equivalent amount of energy from MUFAs was associated with an estimated 13% reduction in total mortality. After uncovering the many benefits associated with these fatty acids, ranging from weight loss to reducing inflammation, these findings are hardly surprising. There is no doubt that MUFAs are truly a healthy fat. However, this doesn’t mean that monounsaturated fats are devoid of downsides. Overeating these fats can lead to fat gain. As with every other dietary fat, monounsaturated fats contain calories — and all calorie sources, when overeaten, can lead to fat gain. So, instead of supplementing with MUFAs to get their benefits, it is best to replace heavily processed foods in your diet with high-MUFA foods. The research suggests that this is a great strategy for getting the benefits of MUFAs and losing weight. Overexposing these fats to heat can trigger the formation of toxic chemicals. When exposed to high heat, every type of fatty acid can breakdown into harmful chemicals. To keep this from happening to the monounsaturated fats you consume, it is best to minimize their exposure to elevated temperatures for long periods of time. Deep frying, for example, will lead to the highest production of these toxins, while low-heat cooking can help keep the fats from oxidizing. If you want a cooking oil that is high in MUFAs, stick with extra virgin olive oil. One study found that it can sustain the rigors of high-heat cooking without forming as many harmful compounds as other commonly used oils. As with any healthful food component, the quality of its benefits relies on the quality and quantity of what you consume. To get the quality right, we must get our MUFAs from the healthiest sources. Since most foods contain monounsaturated fats, there are many ways to increase your intake of these healthy fats. Guzzling down a high-MUFA oil, however, would not the optimal strategy. The majority of the literature suggests that low-carb whole food monounsaturated fat sources are likely the best option for better health. Not only do these foods contain plenty of healthy fat, but they come packed with other benefits as well. All of the above foods derive 50% or more of their fat from monounsaturated fat. You’ll find the highest-MUFA percentages at the top of the list. Each option also contains fiber, vitamins, minerals, and phytonutrients that help further improve health. In fact, some evidence suggests that plant-based sources of MUFAs are more desirable than animal-based sources. However, each one of the above foods contains some net carbs, so keto dieters must be mindful of how much they consume or opt for zero-carb fats/oils to increase MUFA intake instead. With the exception of extra virgin olive oil, each one of these fats should only be used for low to medium heat cooking. You can also use them to add some extra healthy fats on top of your meal, especially if you are on the keto diet. For the most part, animal-based sources only get around 40 to 50% of their fat from monounsaturated fats, which cannot compete with most of the plant-based sources listed above. Nonetheless, these animal foods can serve as a source of healthy fat as well. Feel free to refer to the graphic below for an easy way to reference foods high in MUFAs. How Much Monounsaturated Fat is Good for You? In other words, you can only go wrong with monounsaturated fats if you eat so much of them that it leads to fat gain. As long as you are eating the right amount of calories to reach your goals and meeting your other nutritional needs, feel free get as many of those calories from MUFA-rich foods, fats, and oils as you’d like. While you are on the keto diet, for example, the foods and recipes above can be used to increase your daily fat intake in a healthy way. However, if you aren’t mindful of the calories and carbs you are getting from the above options, you can still impair your results. The general principle here is that healthy fats do the most good for us in the context of a healthy diet and lifestyle. They cannot, however, be used to counteract poor health choices. Monounsaturated fats are the healthy fats most commonly found in olive oil, nuts, avocados, and animal fats. Their name is derived from the fact that they contain one (“mono”) carbon-to-carbon double bond (“unsaturated”). This subtle difference from the other types of fats is the key that unlocks its positive effects on the body. Overall, the research indicates that diets high in monounsaturated fats can help with weight loss, increase longevity, and reduce risk factors for heart disease, type 2 diabetes, and metabolic syndrome. The best results occurred when MUFAs were consumed to replace calories from carbs or saturated fats. High-MUFA foods, such as olive oil, may also help reduce the risk of some cancers, decrease inflammation, and improve blood sugar control as well. To get the most out of your monounsaturated fat consumption, it is best to incorporate more MUFA-rich, low-carb whole foods into your diet. By doing so, it’ll be easier for you to cut out carbs and excess saturated fats for best results. 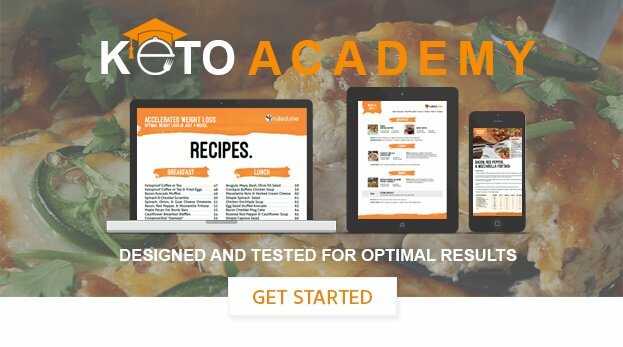 Feel free to incorporate these recipes into your low-carb, keto lifestyle to get the benefits of keto and monounsaturated fats with one simple diet change. To learn more, check out our complete guide to the keto diet.